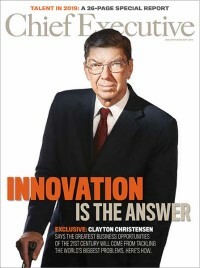 At 77, he is the longest-serving CEO of a U.S. public company. He ranks No. 80 on Forbes’ list of the 400 richest people, boasting a net worth of $6.8 billion. His record of successful retail ventures includes, among others, The Limited, Express, Limited Too, Victoria’s Secret, Bath & Body Works, Pink and La Senza. In 2014, L Brands’ sales reached $11.4 billion. What’s more, 99 percent of the company’s stores are cash-flow positive, with average dollar inventory turns at 3.9 times vs. just 2.8 five years ago. The company operates 2,942 specialty stores in the U.S., Canada and the UK. Its brands are sold in 600 additional, franchised locations worldwide. Wexner opened his first store in 1963 at the age of 26. The experience, he recalls, was “like being shot out of a cannon with no helmet.” He had borrowed $5,000 from his aunt to start a rival store to his father’s. He called it “The Limited” because he offered a limited selection of shirts, blouses and pants. Ten years later, he had expanded to 41 stores, proving that a narrow focus was a winning strategy. The Limited went public in 1969, enabling the company to finance its expansion. By 1979, it was operating 318 stores and Wexner was thinking of branching out to new brands. In 1980, he launched Express, which targeted younger women with more forward-fashion clothes and dynamic colors. The pivotal inflection point came when he snapped up a chain of lingerie shops he spotted in San Francisco called “Victoria’s Secret.” He confesses that he knew little about the business when he bought it in 1982, which proved just as well since its owner was facing bankruptcy. The shop’s merchandising was borderline salacious, geared toward a male point of view. Wexner’s insight was to turn that around and offer merchandise that appealed to a women’s perspective. At the time, most women dreaded the bra-buying experience, which usually involved visiting an obscure area of a department store to sort through a dizzying array of similar-looking products. Wexner changed all that. He wasn’t the first to come up with a lingerie chain, but his natural curiosity about presenting fashion led to experimentation that, in turn, led to a marketing phenomenon. Today, the Victoria’s Secret Fashion Show is a television hit that attracts viewers interested in the celebrity models who showcase the brand. By 2007, Wexner had exited the apparel business, selling a controlling interest in The Limited and Express to Golden Gate Capital, saying that he wanted to concentrate his business in lingerie and beauty. Walking into his outer conference room, one is surrounded by several hundred scent bottles, candles and perfumes. However, what is most interesting about this retail mogul is that, on a personal level, he is quiet and introspective, not the theatrical impresario one might expect of an entrepreneur in fashion. An avid reader of historical biographies, Wexner sees the life and career of George Washington as instructive not just for himself but for all leaders. “This guy bootstrapped himself from a simple background where he was not formally educated,” he says, “and he’s able to hold his own with great minds like Thomas Jefferson, John Adams and Ben Franklin. Essentially, this is a farmer’s son who didn’t go to grade school and wasn’t raised in a big city. I find it inspiring that he could challenge the great minds, was open to learning and yet was humble at the same time.” Biographies of Robert E. Lee, FDR (“both fascinating”) and Douglas MacArthur (“don’t like him, but I find him interesting”) also figure in his private leadership reading.